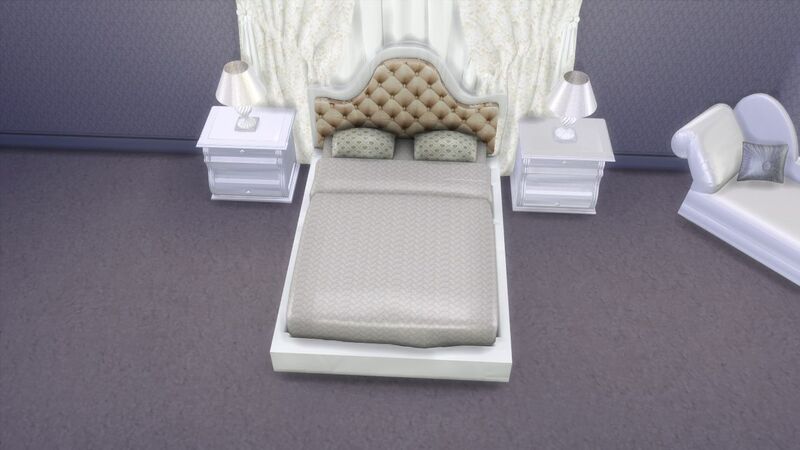 I was asked many times by my fellow simmers at different Facebook groups how I create cc objects for The Sims 4 since I released my first sims 4 cc furniture set Modern Luxury Bedroom Set.As one of my friend wished to learn the ins and out of the sims 4 cc making,I decided to share tutorials on how to make various cc objects for The Sims 4 here on my blog for her and all who take interests to learn sims 4 custom content making.For now my tutorial will cover only Sims 4 furniture making as I don't create hair,clothes and makeup etc for The Sims 4. 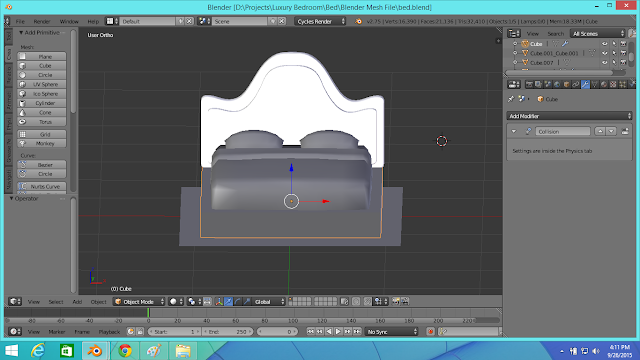 For today I'm going to share how I created the below bed of my Modern Luxury Bedroom Set. Note:Do Not copy-paste this tutorial and publish it as your own on your website/blog/tumblr,if you want to share it just share the link to this post or reblog it on tumblr. 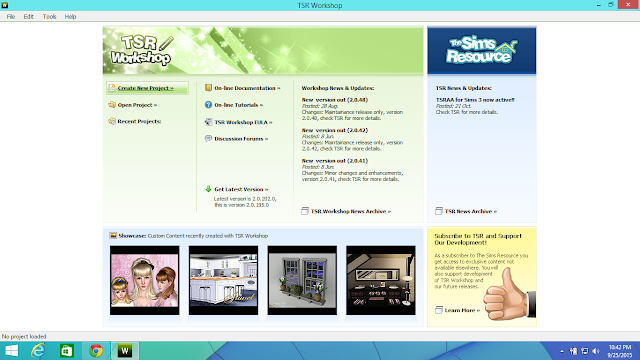 You need to register on the Sims 4 Studio website first before you would be able to download Sims 4 Studio.Register on this link and then download Sims 4 Studio (Joy).Note that: Sims 4 Studio doesn't have Mac version yet.As this tutorial will mainly use Sims 4 Studio as a Sims 4 custom content studio,this tutorial may be unhelpful for Mac user. 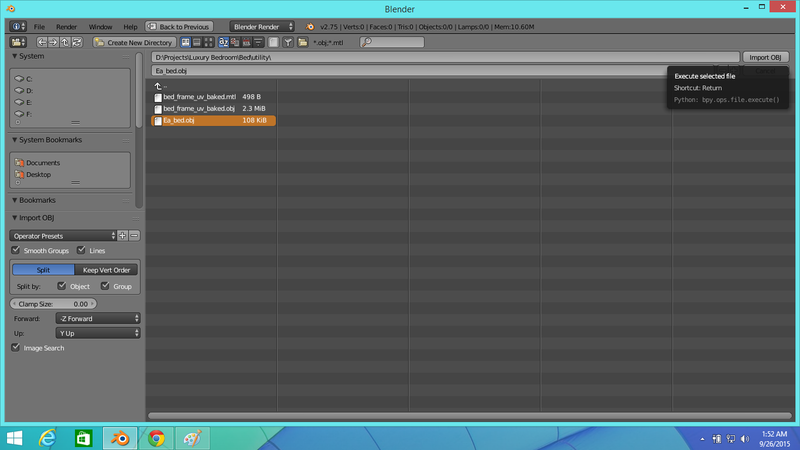 You need this program for adding colors/patterns to your blender 3d model uv map for sims 4.There are other programs as well to achieve this but I'm accustomed to using Gimp.Download Gimp V2.8 or latest. 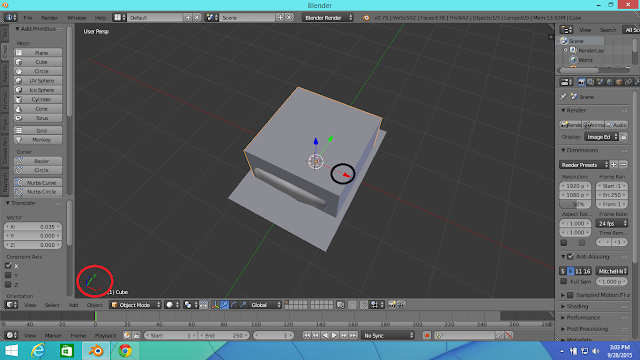 I use TSR Workshop mainly to export Sims 4 objects without rig and data assigned so that I can use them as a base for measurement of my 3d models.Download TSR Workshop. 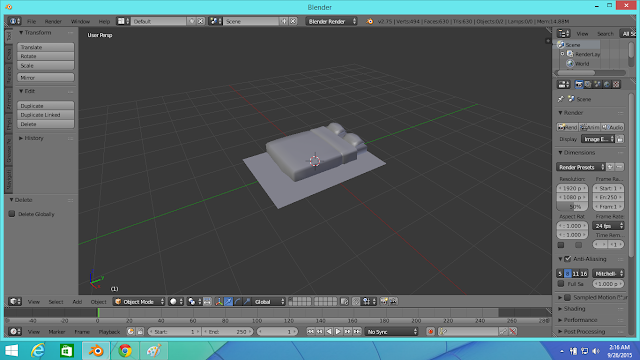 I use Adobe Photoshop CC to create seamless pattern and texture for applying to my sims 4 3d models.This program is not a must to use,you can skip this program if you wish.This is a paid program,so you've to buy it.You can also take a 30 Day free trial.Visit the official website to get or trial it. 1.Install all the required programs if you have not already installed them. 2.Open TSR Workshop and click "Create New Project". 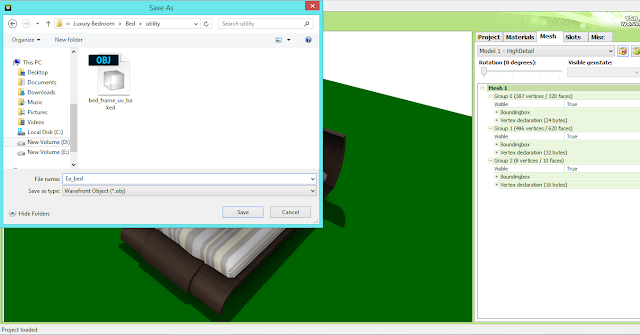 3.Select "Object" and click 'next'.On the next menu,you'll see available Sims 4 furniture of your game.Select any double bed and click 'next'.I've selected "The Utopiate" bed,you can also select it if you wish. 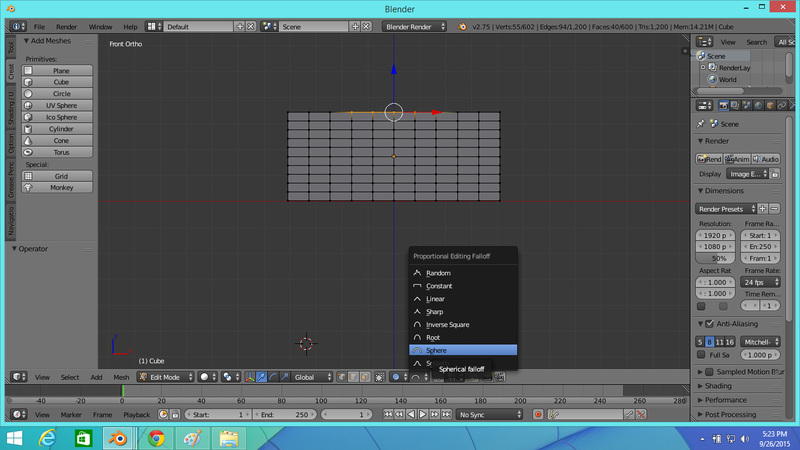 Once the bed is loaded click on the 'Mesh' tab and select 'Model-1 High Detail' from the drop down menu just under the 'Mesh' tab and click the red circled button in the above picture to export the mesh. 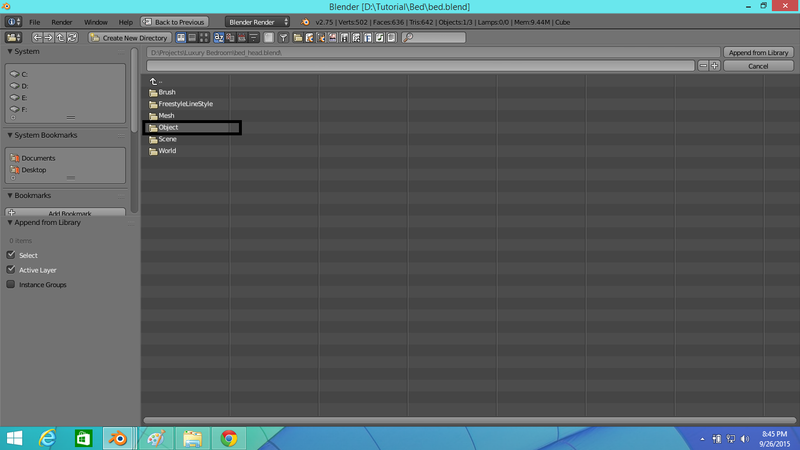 Now when saving the exported mesh select 'Wavefront Object (*.obj)' on 'Save as type' field.I create folders and sub-folders specific for each object because it keeps things organized.Here I saved it as 'EA-bed'.After exporting the mesh,close TSR Workshop.We don't need it anymore for now. 4.Open Blender and delete everything in the scene.To select an object in the scene right click on the object you want to select and to delete an object press "Delete" key on your keyboard after selecting the object.Then click delete on the appeared options like below. Now select the EA bed file you exported from TSR Workshop and click "Import OBJ"
5.So now we have imported the bed mesh file we'll be using as a base to make our custom bed. 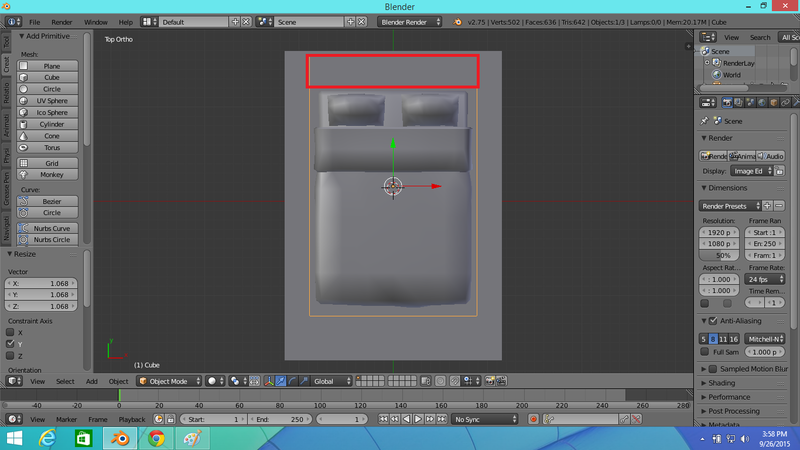 Press "A" on your keyboard to deselect the bed.This bed mesh has 3 parts-Bed Frame,Bedding and the Bed Shadow we see in the game. 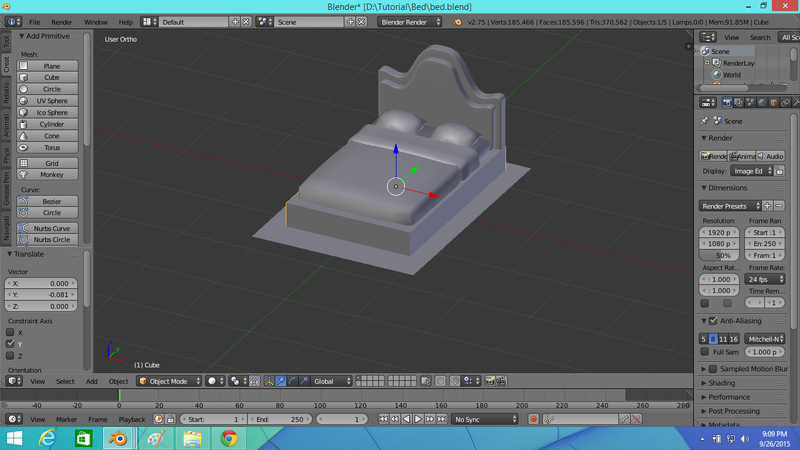 You shouldn't change the Bedding shape because the bedding has assigned rig and animation data in it.If you change the Bedding you will mess up the game animation of your Sims like sleeping,woohooing,pulling bed sheet over them while sleeping etc.Don't delete the Shadow because we need it for keeping the measurement of our custom bed frame in line with the EA bed sizes.We will only change the Bed frame.Delete the Bed Frame because we will now create and assign our own bed frame to the bed. Below is an example of the bed frame I created and added to the bed of my Modern Luxury Bedroom Set. 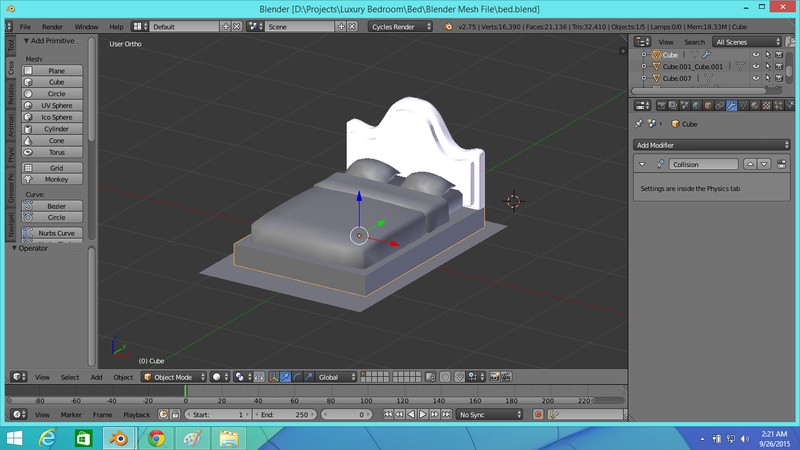 6.I'll now explain basics of creating a bed frame in Blender.You should also read the Official Blender Tutorials on various types of meshing. Now we're going to add a base to our bed.On the left sidebar of Blender,click on 'Create' tab and click 'Cube' to construct a cube mesh. You can see below that the cube has nearly eaten the bed.So we need to re-size the cube to make the base of our bed. 6.To rotate the 3D view just press and hold your middle mouse button or mouse scroll button and move freely to see different sides of your model.To zoom in and out,scroll your mouse up and down.To move an object from its position click and hold the axis arrow (see the picture below) along which you want to move the object,for example to move the cube along x axis;click and hold the black circled x axis arrow line shown below and move your mouse.Now you can move the cube only along x axis,similarly you can move the cube by y and z axis.The red circled area shows the axis.If you want to move the cube without any axis restriction,press "G" on your keyboard and move your mouse to move the cube freely. Now go to the top view by pressing "7" on your keyboard.You can see below in top view there is only x and y axis (marked by red circle),the x axis defines the width of the object and the y axis defines the length. Select the cube if you already have not selected it.Now to change the length of the cube first press "S" and then "Y"(as the y axis defines the length in top view),then without clicking anything move your mouse to re-size the cube by length.Re-size to your wish but don't cross the shadow.By the way,pressing only "S" on keyboard will allow you to simultaneously re-size length,height and width of the cube. Now go to the right view/right ortho press "3".Now we're going to change the height of the cube.You can see the height is along z axis. Press "5" to show the grid view.Now press "S" and then "Z" on your keyboard to re-size the height.Move the cube little up or down to place it under the bedding correctly.Also you have to align the line pointed by green arrow and the line pointed by red arrow in the picture below as you don't want that half of your bed base go through the floor of your game.The line pointed by red arrow defines the floor in Sims 4 game.The line pointed by green arrow should touch the red circled line like the picture below unless you want to design a floating bed.You can also change the length of the cube by pressing "S" and "Y" on your keyboard. 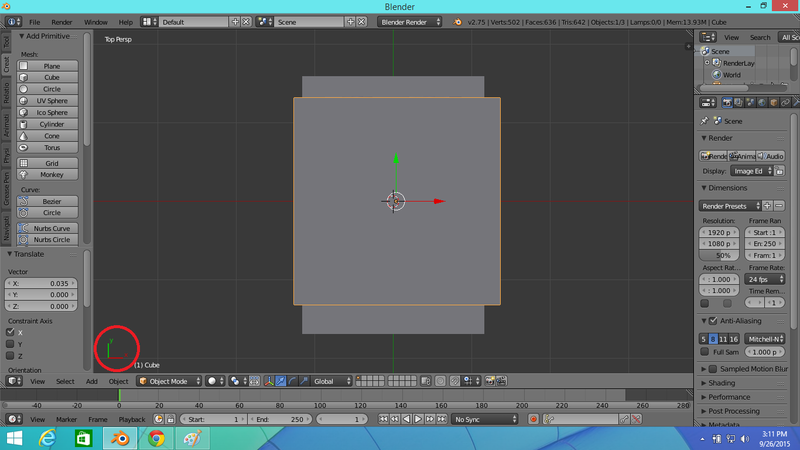 The above picture show the re-sized cube by height.Now go to top view again by pressing "7" and re-size the cube by its width by pressing "S" and then "X".Move the cube a little bit.The final bed base will look somewhat like the below picture.We will add a bed head in the red square marked area. 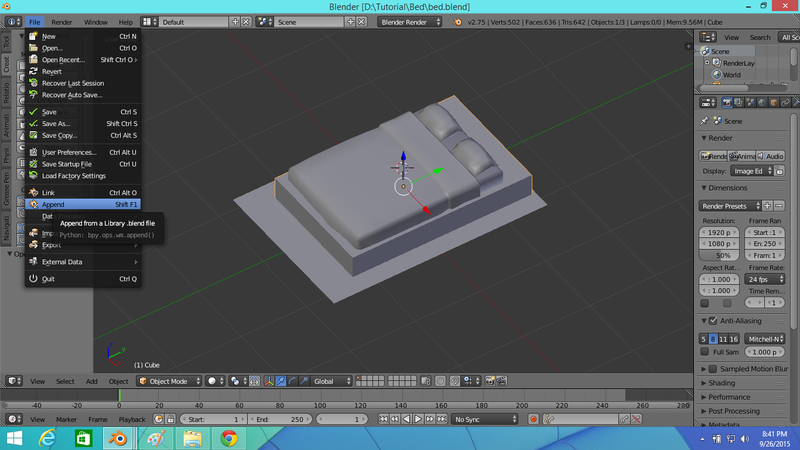 I've explained here the basic technique of creating a bed base in blender.Play with the techniques described above to create your own unique bed base. 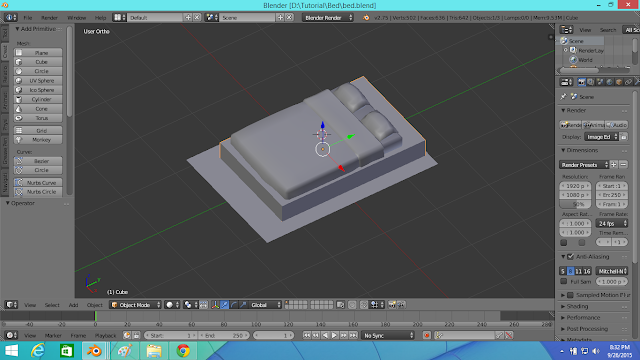 7.You can add a square shaped bed head by adding and re-sizing another cube following the instructions on step-6.But now I'm going to tell you the technique of creating advanced shapes of bed head like the curve shaped bed head I created for the bed of my Modern Luxury Bedroom Set. 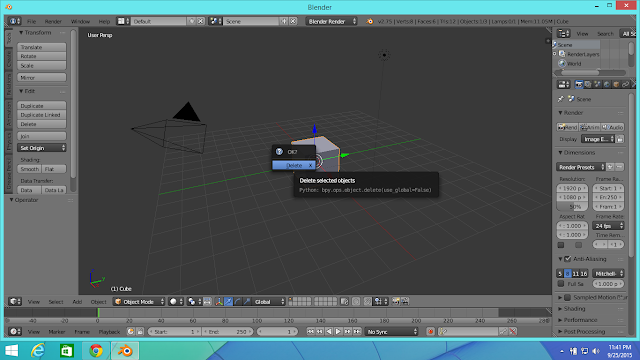 For this first save your current bed project but don't close your current project and open another blender window by start the blender program again from your desktop shortcut or windows app lists. 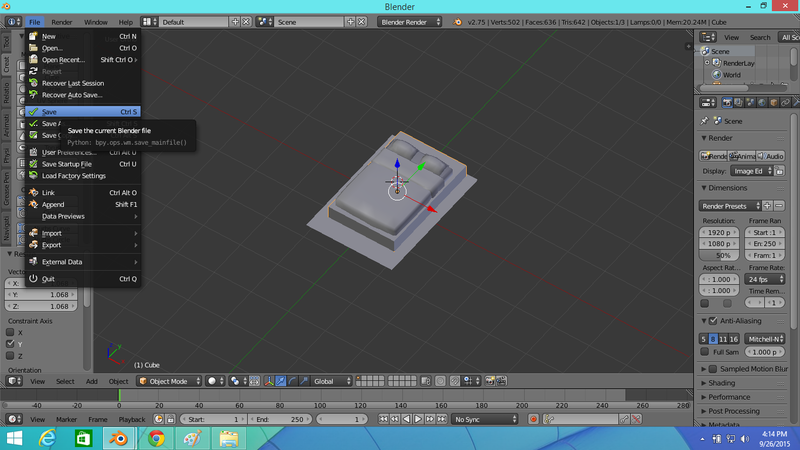 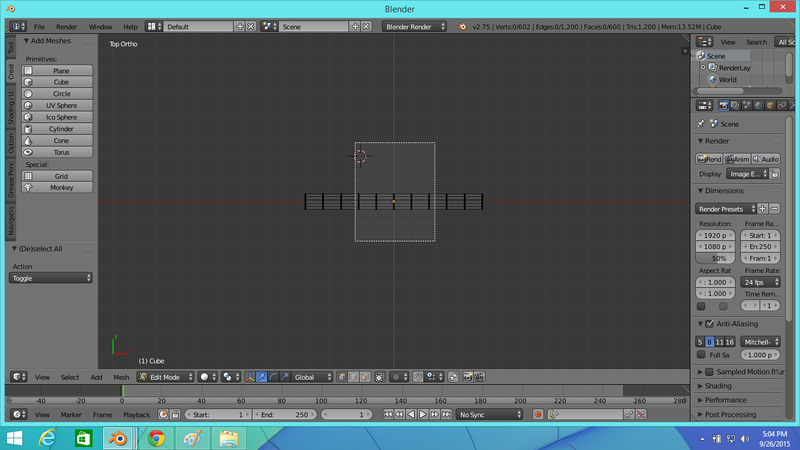 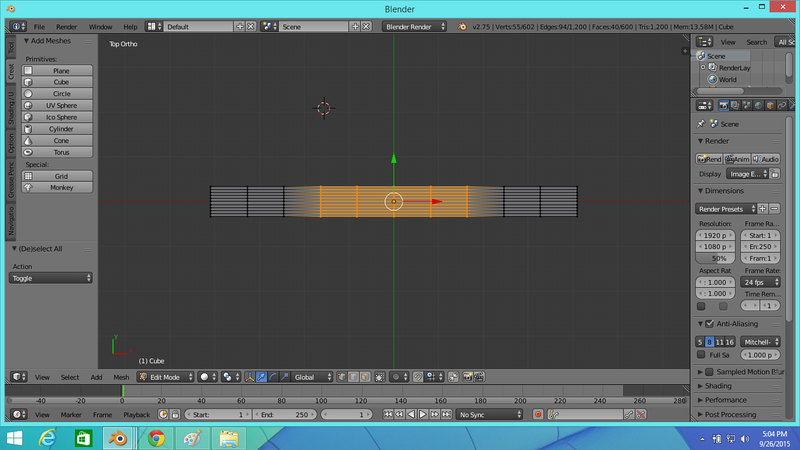 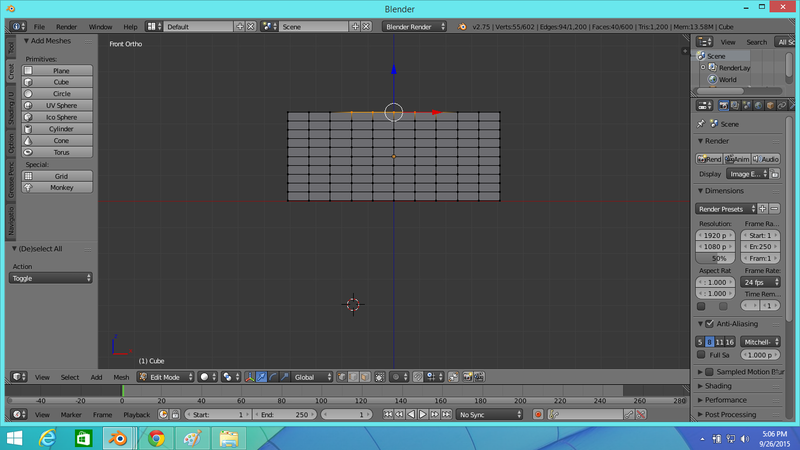 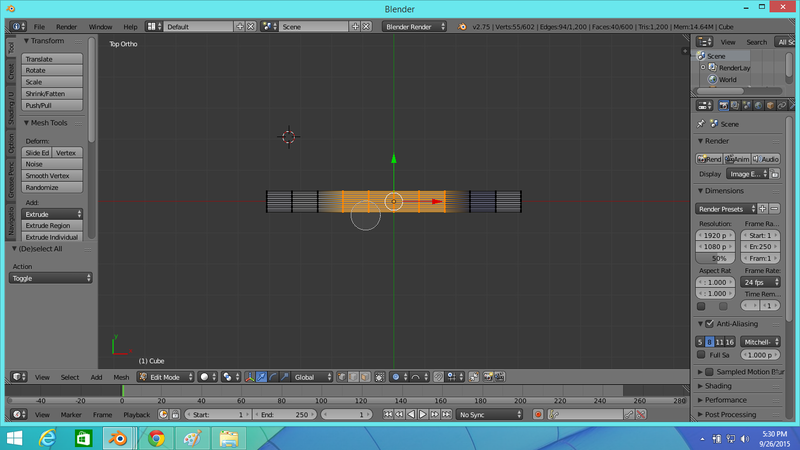 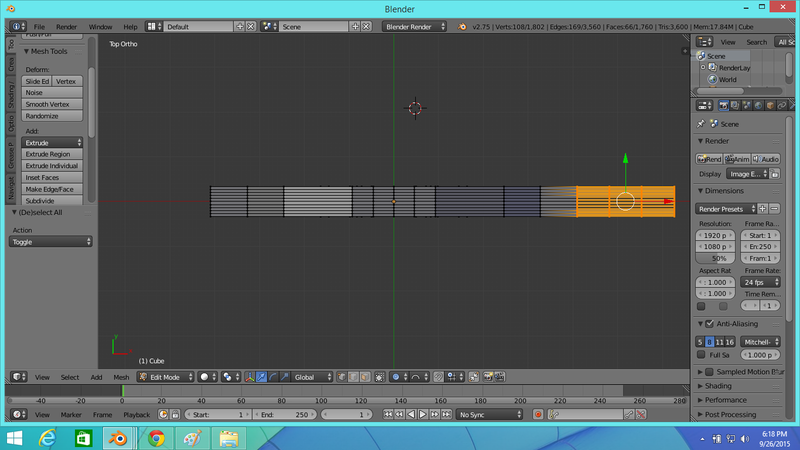 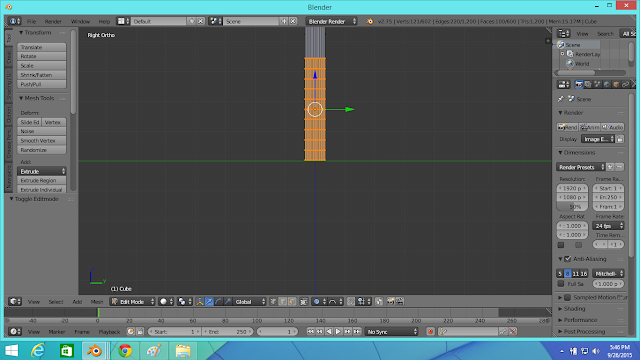 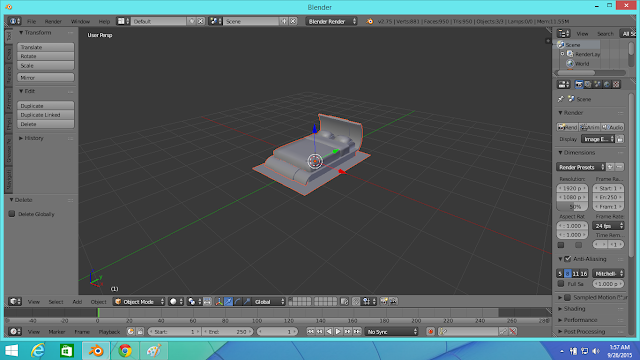 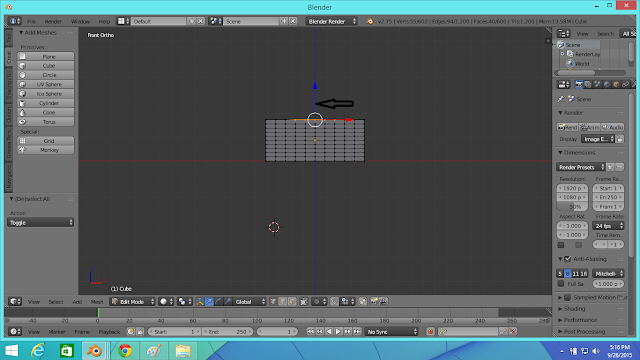 Follow step-4 to delete everything in the scene of your new blender window and then add a cube. 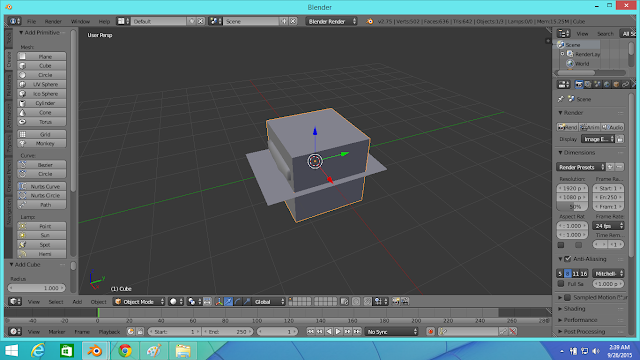 Now go to top view and re-size the cube like the second picture below. Now go to the front view by pressing "1" on your keyboard and press "5" to show the grid view if needed.Re-size the height of the cube.Move the cube to align it to the red line pointed in the picture below. 8.Now select the cube if you've not already selected it.Click on the 'Edit Mode' to go to edit mode of blender shown in the picture below. Press "A" on your keyboard to select the full cube if it's not already selected. Now press "W" on your keyboard and click on "Subdivide" from the options. Now assign the number of cuts in the field marked by black box in the picture below.You can assign any number greater than 1 and up to 10.Actually Subdivide will divide the object in parts which will determine the shape of the object while adding modifier or editing proportionally.We are assigning here the Number of Cuts to 9 as we'll do proportional editing. 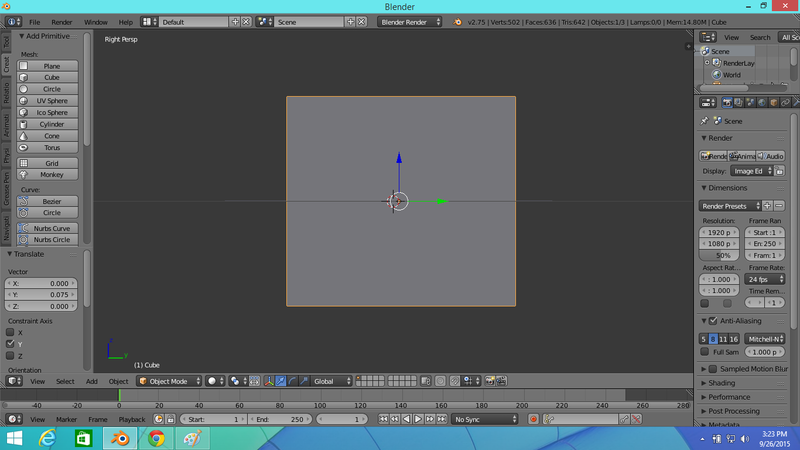 We'll now raise the middle portion to a sphere shape.Press "B" and click,hold and then move your mouse to select the portion shown in the picture below.I've chosen a small portion in the middle because I'm going to add extra curves on both sides of the sphere shape.If you want to make your bed head only round shaped then choose a larger portion in the middle. Don't click anywhere now and just press 1 to go on the front view. 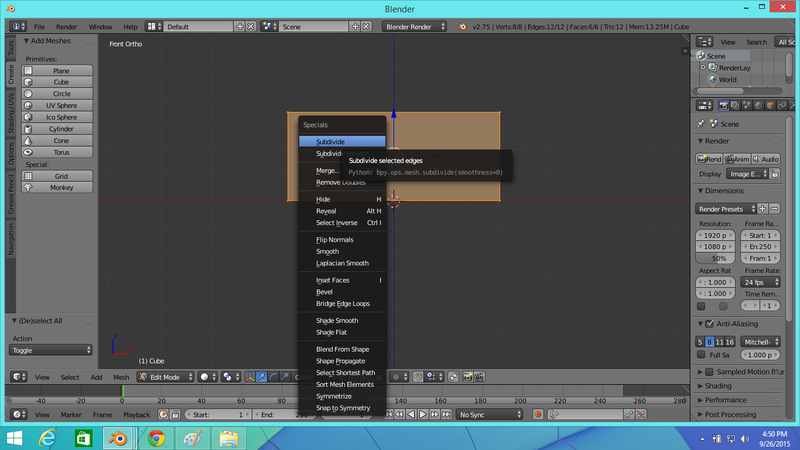 Select "Enable" from proportional editing menu shown below. 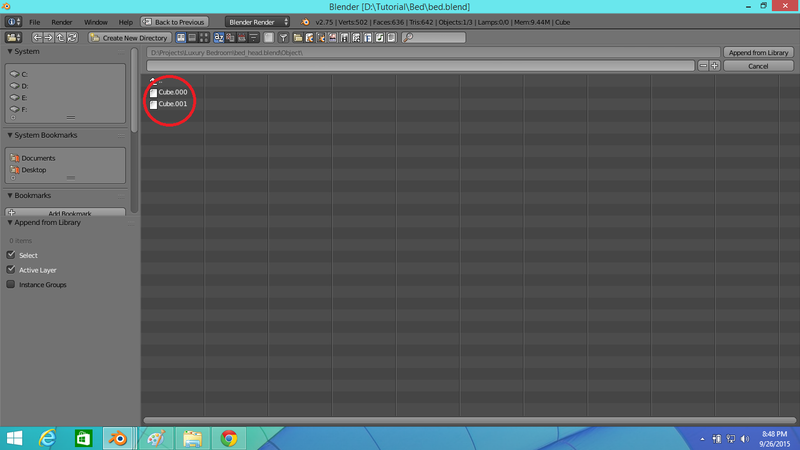 From the proportional editing fall off menu select "Sphere" shown below. Now click and hold on the z axis line pointed by an arrow in the picture below and move it in upper direction until you achieve the shape shown in the 2nd picture below. Press "A" to deselect the portion you selected earlier and now go to top view.Press "C" and click,hold and select the portion shown in the picture below.Press "Esc" once you selected your portion.Actually we're selecting the middle flat portion in the above picture to give it a sphere shape. Now go to front view.Now click and hold on the z axis line and move it in slightly downward direction until you achieve the shape shown in the picture below. 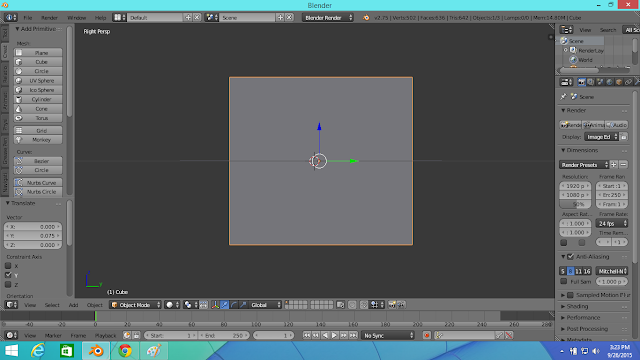 Now press "S" and then "X" and move your mouse to left along X axis until you get the sphere shape shown in the picture below. Click to confirm the shape and press "A" to deselect the proportion you selected. 10.Now go to the right view and press "C" and then select the portion shown below.We're going to expand the size to add another curve shape. 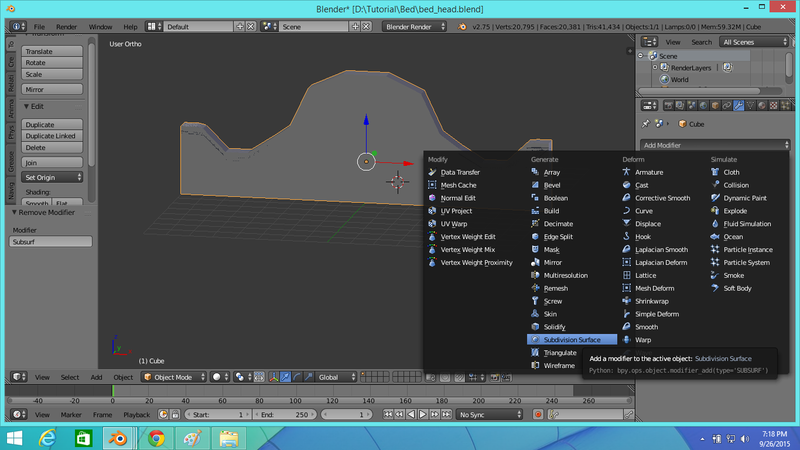 Now go to the front view and select "Extrude>Region" from the Tools tab in the right sidebar of the blender. Now press "X" and then expand like the picture below. 11.After expanding deselect the portion you selected earlier and then press "Z" on your keyboard to go the wireframe mode and press "B" to select the portion shown below in the picture. 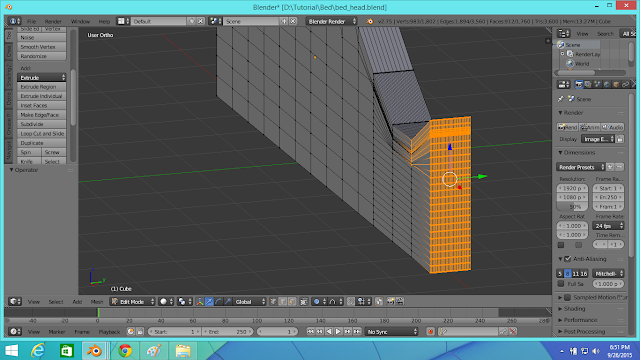 Now subdivide the portion (step-8) and assign the number of cuts to 2. 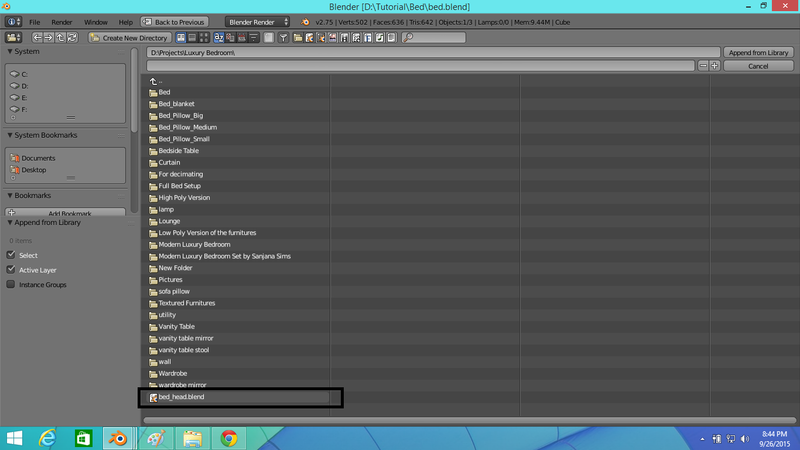 After subdividing,deselect the selected portion and press "Z" again to go out of the warframe view.Then go to the top view and select the portion shown below after pressing "C"
Now go to front view and select "Enable" from the "Proportional Editing" and then "Invert Square" from the "Proportional Editing Fall Off" menu.Now click,hold and then move downward the z axis line until you achieve the below shape. 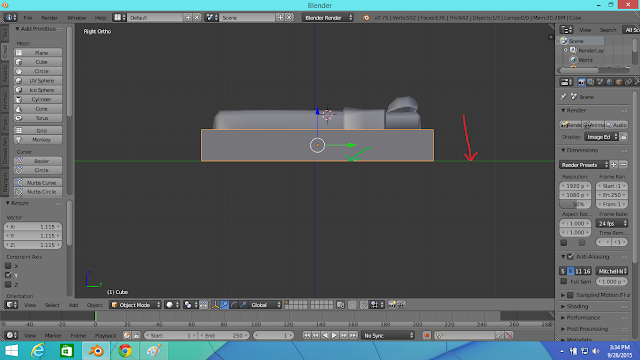 After achieving the above shape deselect the selected portion.Now go to top view again and select the portion shown below after pressing "C". 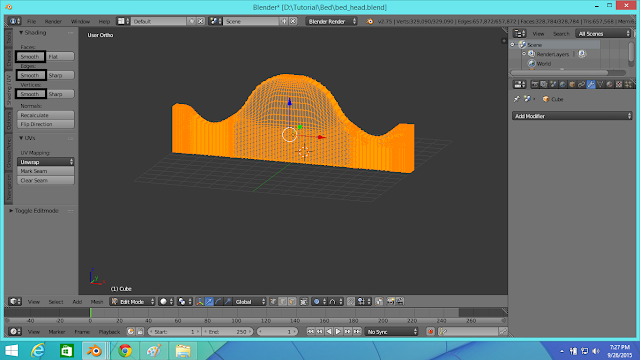 Now go to the front view and click,hold and then move the z axis line downward until you achieve the shape shown below.After achieving the below shape press 'A' to deselect the selected portion. 12.Now add a little expansion (see step-10) at the right beside the curve like shown below in the second picture.Before extruding you have to use the key "C" and "B" to select all the parts of the portion shown in the first picture. After adding that little expansion follow step 9 to create a shape like below. 14.Now go to object mode. 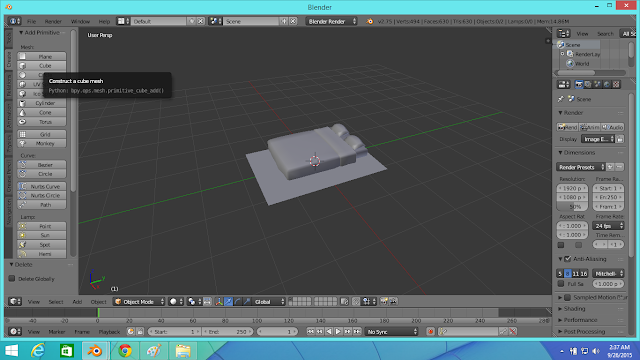 Select the bed head in object mode by right clicking on it.Then click on add subdivison surface modifier as shown in the picture below. After adding the subdivision surface modifier your bed head will look like this. 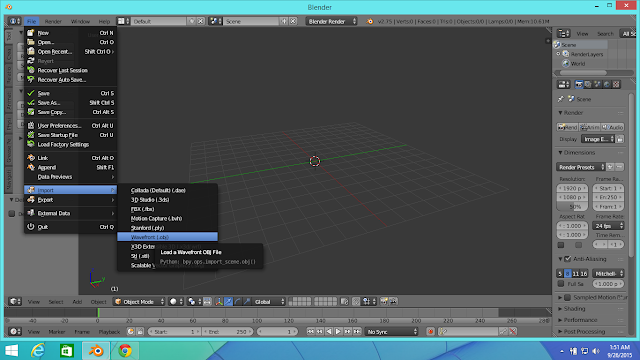 Press "Tab' on your keyboard Make it more smoother by clicking on the smooth button on the black box marked options below. 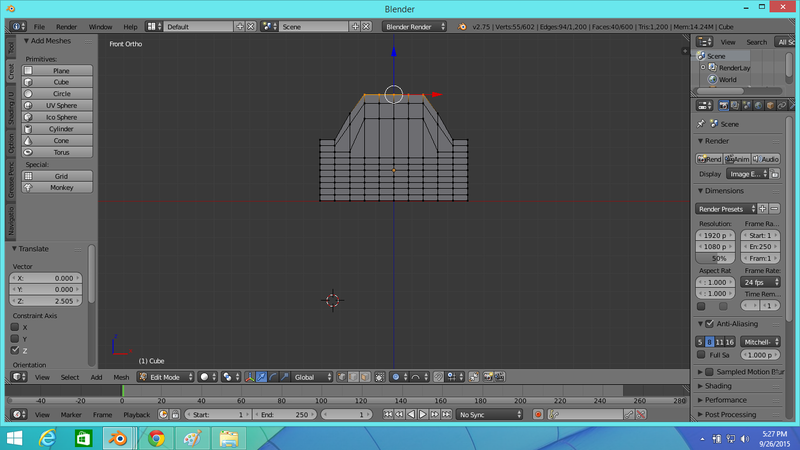 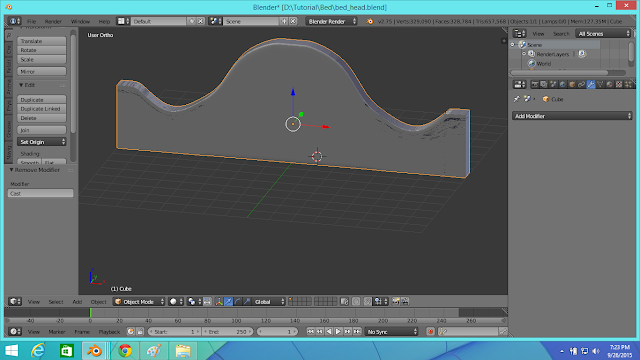 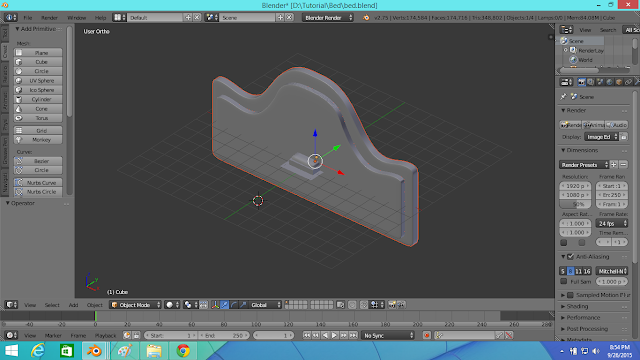 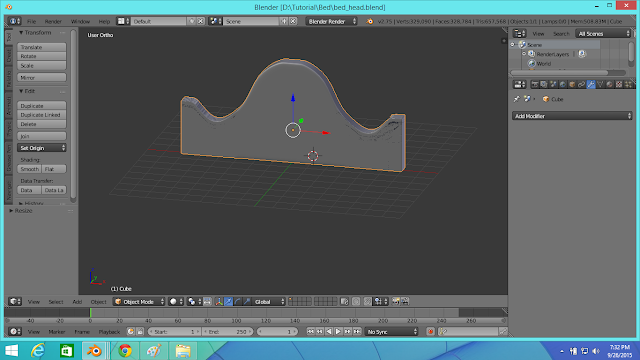 Go to object mode and re-sizing the bed head in the object mode will give the shape like below. 15.Basically I used the technique described from step 7 to 14 to create the below bed head of my Modern Luxury Bedroom Set Bed.I've joined two curve shaped bed head to create the below bed head. 17.Create your own unique bed head by playing with the technique described in the steps 7 to 14 and save your bed head. 18.Now we're going to import the bed head into the bed with bed base that we saved earlier.Head to the bed with bed base file of the step 6. 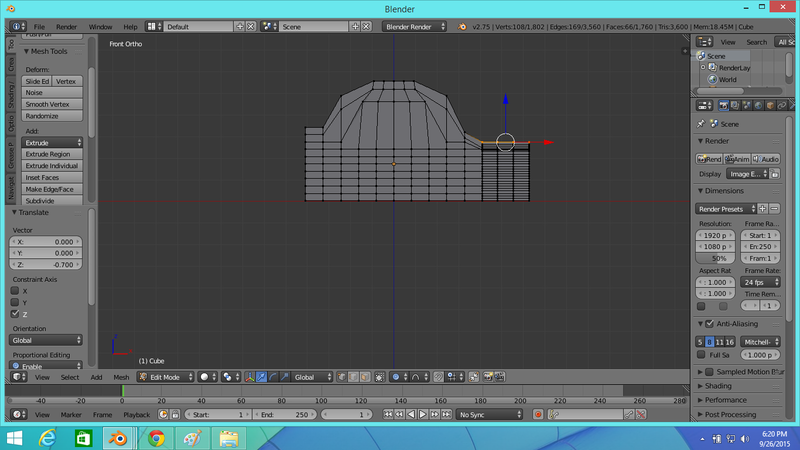 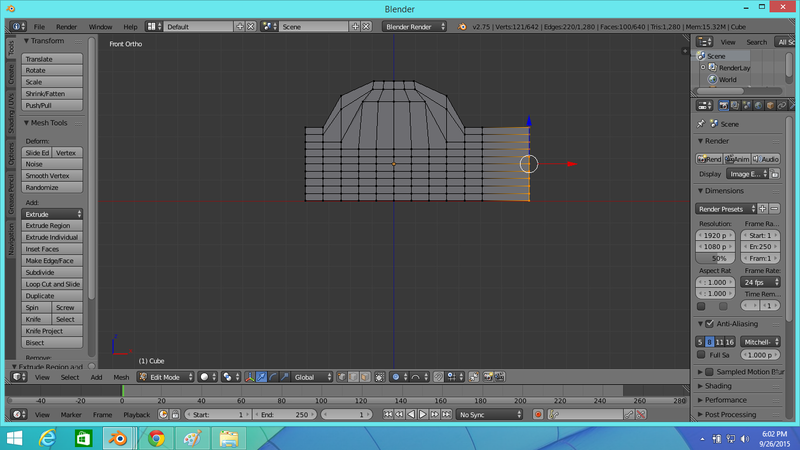 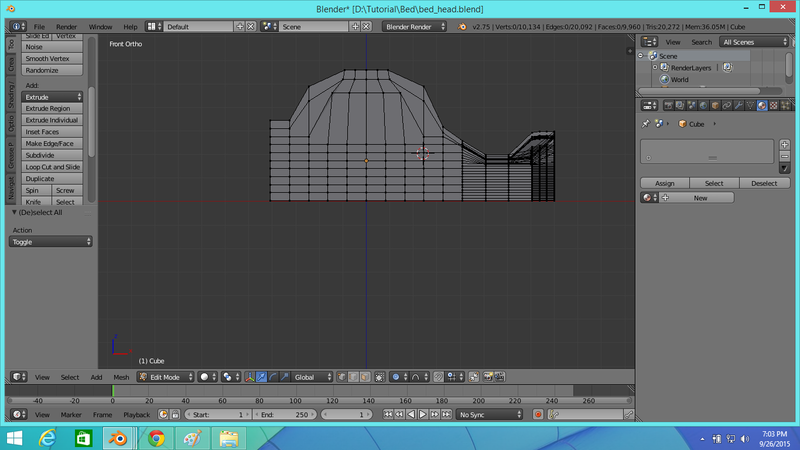 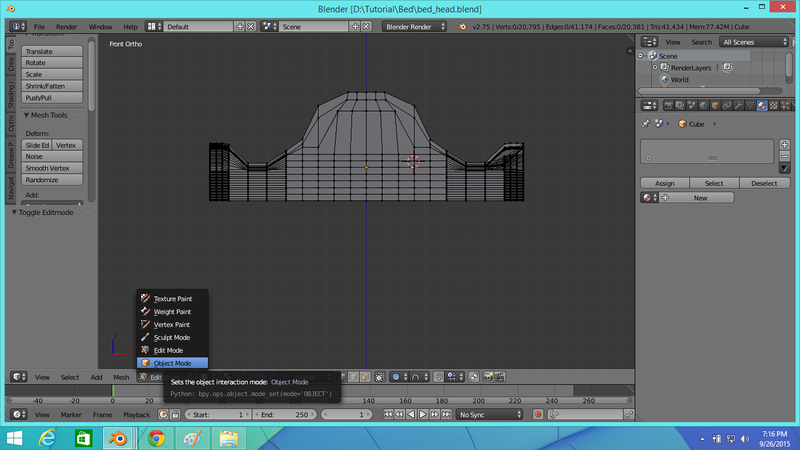 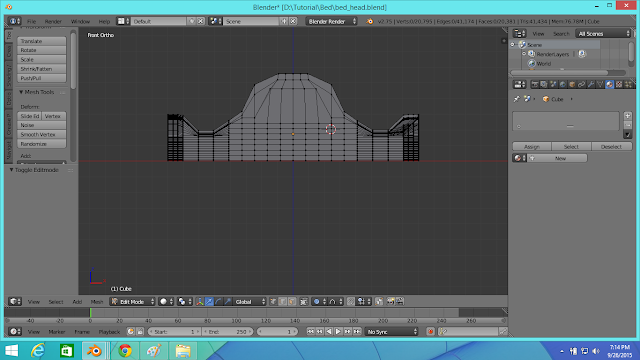 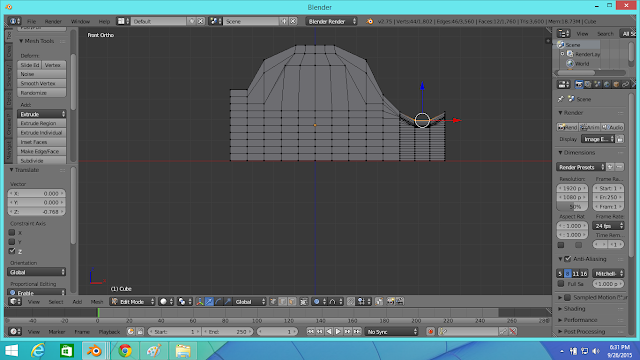 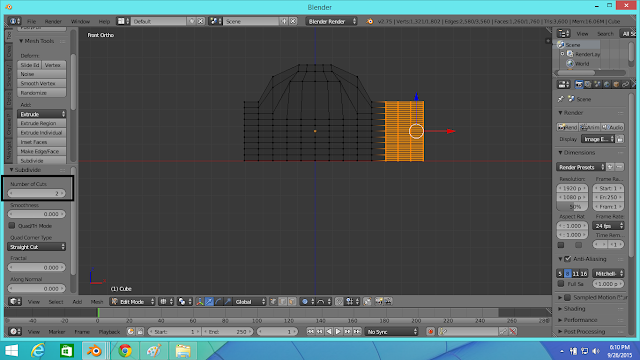 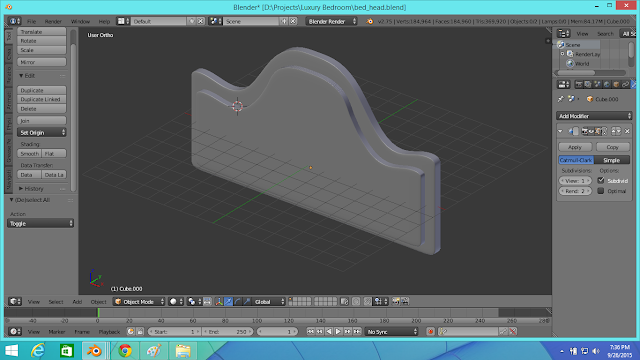 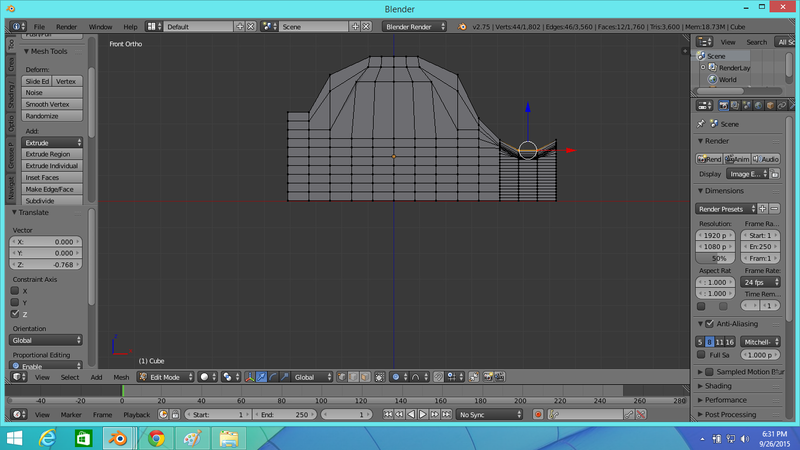 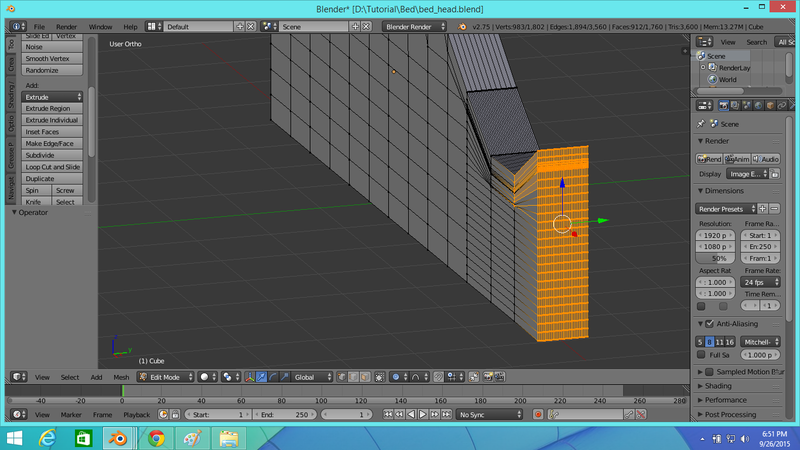 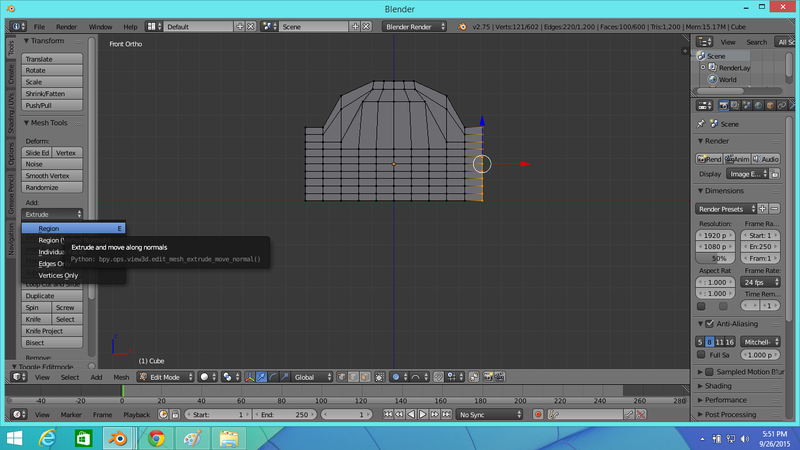 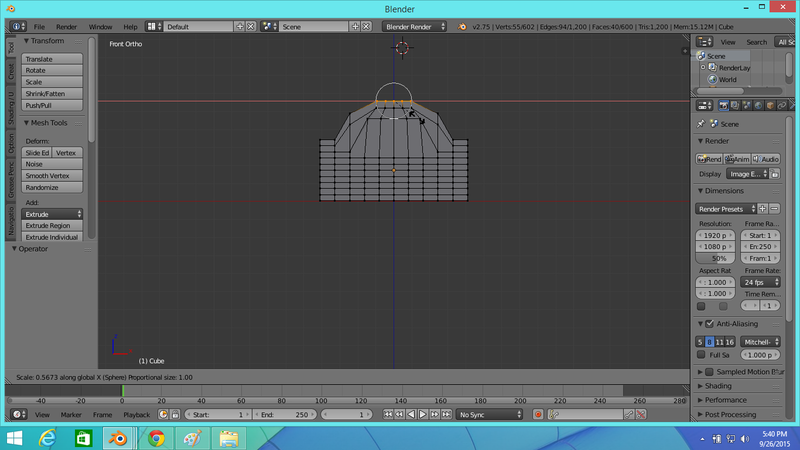 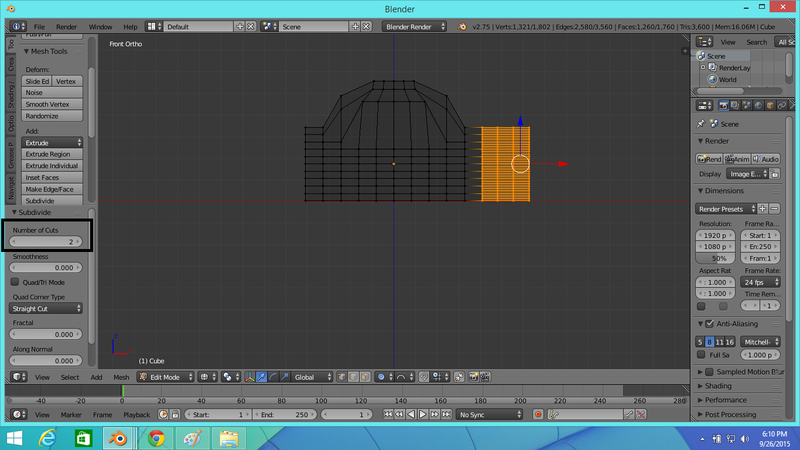 For the sake of this tutorial I'm going to import the below bed head of mine.You'll import the bed frame you created. Click File>Append as shown below. Now click on your bed head file (1st pic) and then click on "Object" folder (2nd pic).Then select the file (shift+left mouse click to select multiple file) in the object folder and click "Append from Library"
You can see on the 3rd picture above that there are two files because my bed head mesh consists of two parts/objects.So I had append each of them.After appending you'll see something like below but don't freak out,we are going to re-size it. 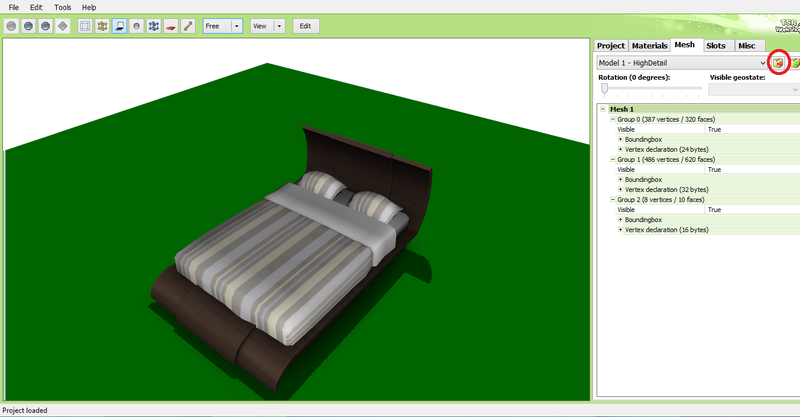 19.As my bed frame consists two parts I'll now show you how to group individual objects for modification purpose without joining them.Press "A" to deselect at first.Then right click on the first object you want to group with other objects and then press and hold the "Shift" key on your keyboard and right click all the other objects you want to group with the first object.You will see a red borderline along with yellow borderline on your grouped objects like on the above picture.Now follow the step-6 to re-size and move your bed head and place the bed head on its relevant location.As I grouped my object,I re-sized and moved them together at once.You may also re-size the bed base to adjust with your bed head.Below is an example of my bed with bed head after re-sizing and moving. 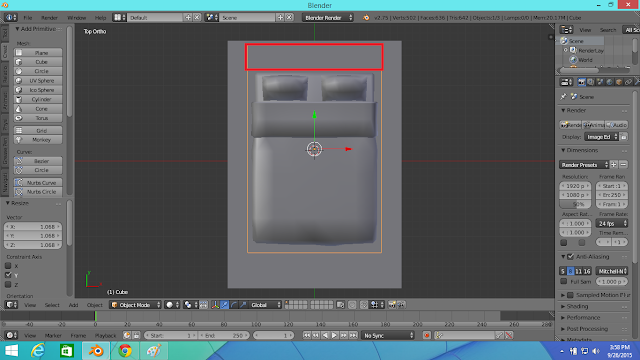 Save your file when you're done,actually save often in between your work.So we're done with our meshing of a bed for Sims 4. Feel free to comment below if you get stuck at any step in this tutorial and also if you've any questions regrading this tutorial.I'll be glad to assist you.You can also contact me using the comment from on the sidebar.